How to describe this most unusual winter? 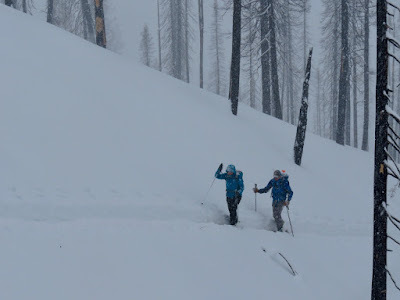 Twelve days ago, on a stormy and snowy Saturday, we were enjoying fantastic pow skiing. With the new snow, a warm front arrived at the area Saturday night. The next day, Sunday, January 28 dawned with warm snow on top of the cold snow. The wet new snow resulted in difficult skinning conditions with globs of dry cold snow sticking to the skins [I promised myself to never forget having glide wax, somehow my Chilean beeswax slipped out of my pack]. By Monday morning cooler temps resulted in a widespread thick crust at Mores Creek Summit. Last week temperatures have been mild, mostly at or above the freezing point. Check SNOTEL chart for temps and Snow Depth for MCS included below. These temperatures have contributed to the dramatic settlement and densification of the snowpack at all elevations. Last Saturday we got lucky and rain skipped MCS. The skiing conditions were instructional - a hefty breakable crust that elicited thoughts about life and death at every turn. 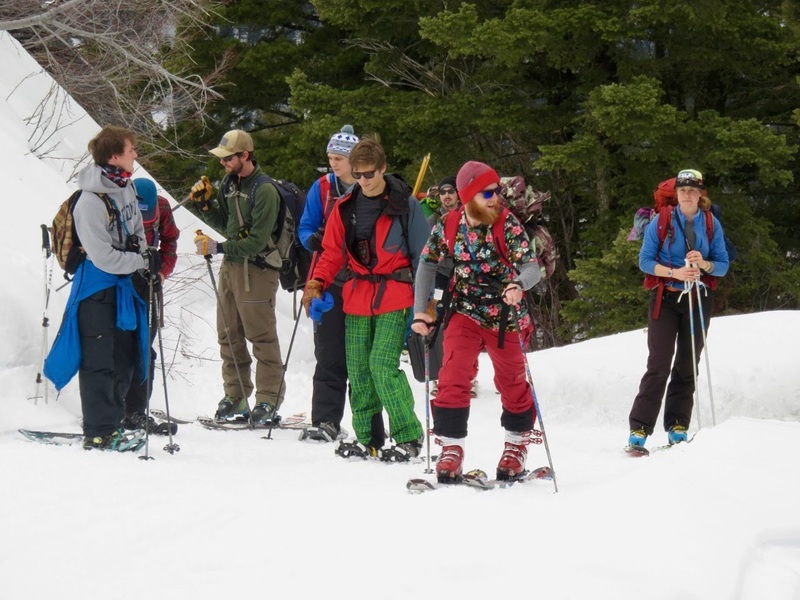 All in all, I had a great time with BSU students during a Geoscience Avalanche and Snow Physics field day at Pilot Peak. The students were able to compare Saturday's isothermal snowpack with the snowpack from January 13 when they last visited Mores Creek Summit area. The snowpack back then showed evidence of instabilities and was characterized by its cold content and temperature gradients that produced a gamut of facet crystals. BSU GEOS466/566 (Avalanche and Snow Physics) Field Day - February 3rd. Not only did the GEOS466/566 class did awesome snow science, but they also successfully completed their multiple avalanche victim rescue simulations. In a few weeks, they will be participating in a multi-day science field camp at Soldier Mountain Yurt, where scientific instrumentation will be used to survey and characterize snow properties. Last Sunday the weather was not generous. It rained most of the day at Mores Creek Summit! For a short time above 7400 feet, it precipitated snow, but it changed into rain later in the afternoon. But we put a good face and completed an Avalanche Science 1-day Avalanche Rescue course. And I was impressed by the few snowmobilers that ventured out in such conditions. Sunday rain did not result in wet loose instabilities. The surface crust developed during the last two weeks enabled "lateral flow" of liquid water. Lateral flow is when liquid water instead of percolating through the snowpack flows "laterally", between layers within in the snowpack. Sunday's liquid water lateral flow inhibited the wetting of the snow within the snowpack and instead facilitated draining the liquid water into creeks. The bad news is that water is not stored in the snowpack, which is what water managers want - 😱. The two concerning structures within MCS snowpack; buried layer of fused surface hoar and the deeply buried early season facet/crust did not show evidence of reactivity. It is likely that we might not have to worried about these layers anymore. And what we need next is MORE snow precipitation in the top of the existing snowpack. The coverage above 7000 feet is great, with lower levations still looking brushy. Moving into another most important topic ... I have been experimenting with various avalanche course formats. It is true that the current demotivating snow conditions do not compel us to seek avalanche education, resulting in low demand for avalanche education at MCS. The snow conditions at MCS above 7000 feet exceeds the depth from most locations in Utah and Colorado. 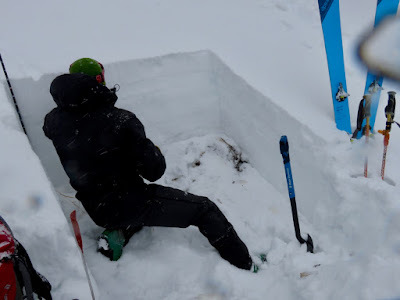 During a professional course I was teaching in Utah, snow depths averaged 80 cm at 9000 feet. Shallow snowpack during Bridge Course in Utah - 9000 feet, February 2. 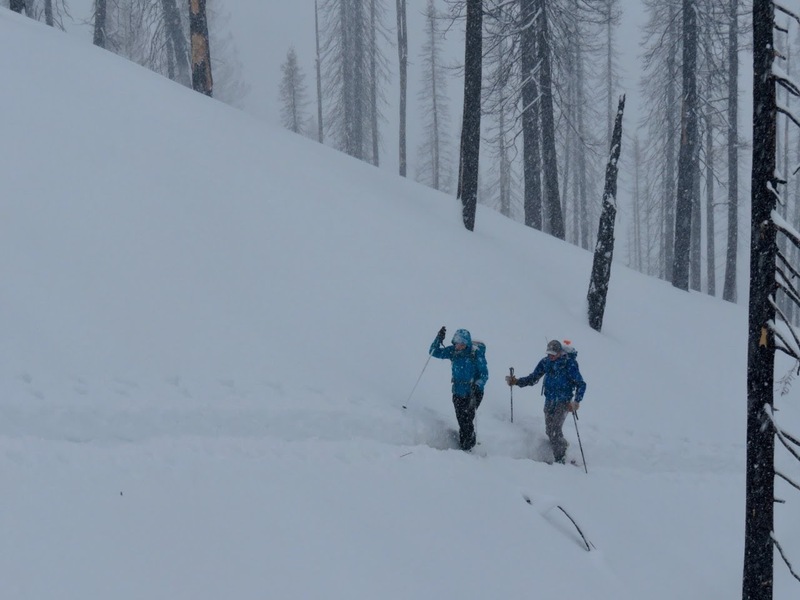 But it is unlikely that is the whole story, yes the courses seem expensive but I failed to explain the concept behind the $825-course fees - to provide the best avalanche education possible close to Boise! The avalanche courses I am offering at MCS are priced higher in order to offer a more intimate learning environment and limit course sizes to six or fewer participants. 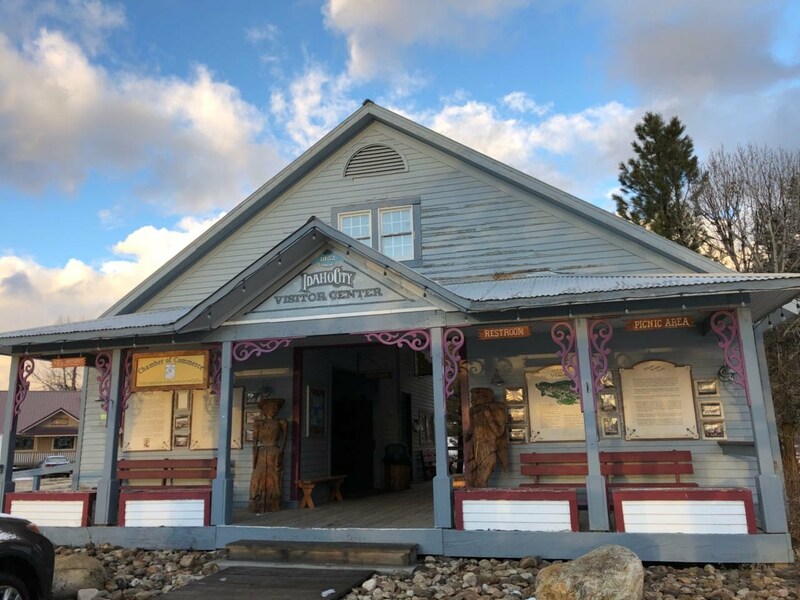 The per student fee by AIARE, the AIARE providers fees, Idaho Outfitters and Guide Licence fees, USDA-USFA Special Use permit fees, Classroom at Idaho City Visitor's Center, and insurance are amortized with much fewer students. In addition, I packed two courses into one; an "AIARE Companion rescue" and "AIRE Level 1/2" that further increased course costs. Moving forward - Earlier this week I updated the line-up of Avalanche Science courses. All avalanche course fees were reduced. The number of participants for these courses continues to be limited to a maximum of six. I firmly believe this is essential to be able to provide the best possible avalanche courses in the USA and internationally. In addition, it is fundamental to have a lot of touring and skiing/riding time, particularly with the fabulous skiing available at MCS. The courses will continue to include the AAA certified Instructor certification as well as the AIARE Diploma. 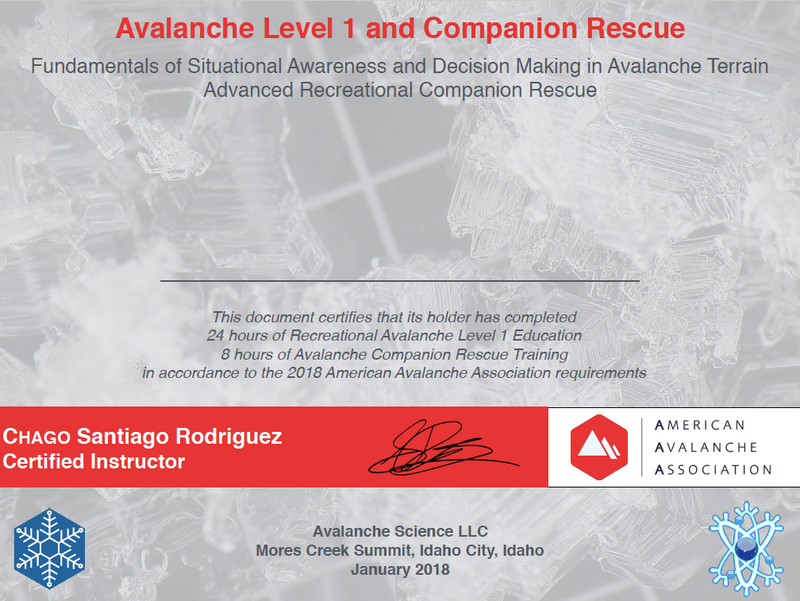 In order to reduce Avalanche Science course fees, the Companion Rescue will not be bundled anymore with Level 1 or Level 2 courses. The science grade snow kit will not be included. Participants can purchase a snow kit during the courses. At Avalanche Science Courses at MCS, you will find the line-up of courses for March. There is a new offering Boise folks have bee asking about; a 2-day weekend introduction course. This NEW course includes the AIARE Companion Rescue component. 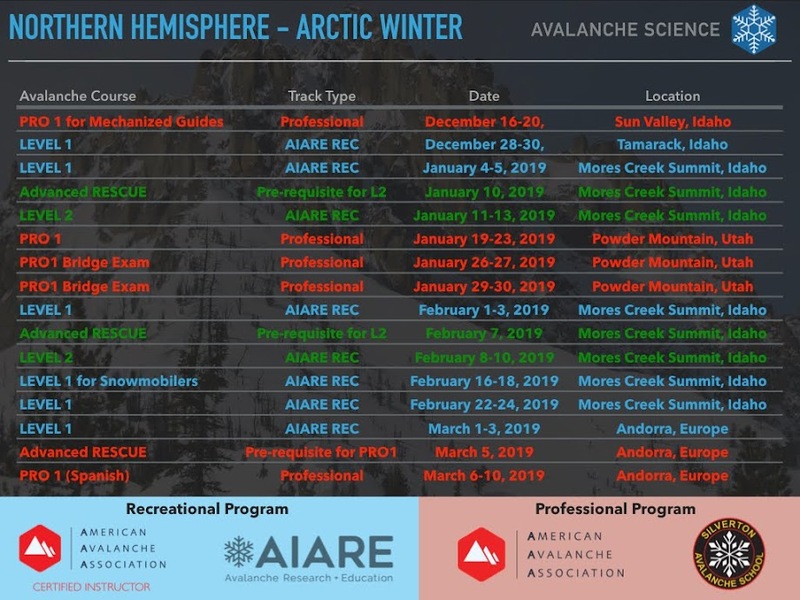 There are two Avalanche Level courses dedicated to specific demographics. An AIARE Level 1 course for Women and another for Young Adults (18-24 year old). The AIARE Level 2 has been designed with the PRO1 progression in mind. This course will prepare you to pass the Bridge Course, that will convert this Level 2 into a PRO1 certification. Friends, visit AVYSCIENCE.COM. I will appreciate if you have any feedback, suggestion, or other courses you will like to see us provide to our community of winter backcountry recreationists.